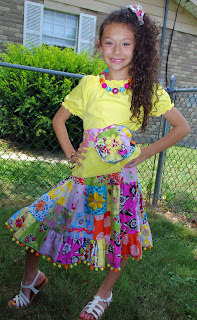 The Allie’s Quilt Skirt is my daughter Allison’s first design. She brought me a picture she drew of this multicolored skirt with trims and ribbons within some of the squares and the pom pom trim on the bottom. 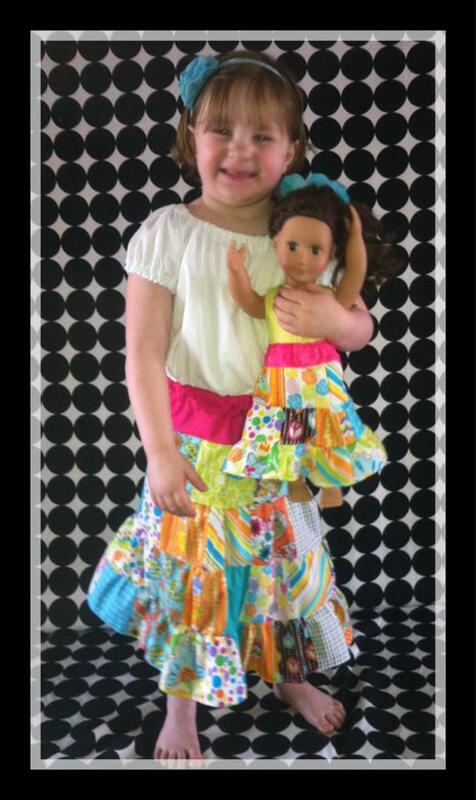 The skirt is made with a top yoke and elastic waist and tiers created with 5” squares. This pattern fits dolls to size 12. The Custom Fit option gives you control of the width and length of the your skirt by choosing the number of tiers or adjusting the number of squares within the tiers. You can make a variety of sizes using our pre-calculated tiers/squares chart. The Standard Fit option give you all the measurements you need to quickly cut and create a skirt without measurements or calculations. We have paired this skirt with a knit shirt made from our Fun and Easy Knit Top, the Peasant Top, and a fabric flower hair pin. 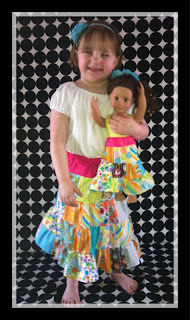 We’ve paired this skirt with a knit shirt made from our Fun and Easy Knit Top/Dress and our Fabric Flower Tutorial Hair Pin. This video will help you with the chain piecing part of the e-pattern.